I was born in Middletown, Ohio and was raised in Chillicothe, Ohio, Germantown, Ohio, and Eaton Ohio. I just retired from the U.S. Navy after 21 years of serving with the Navy Seabees. My wife and I now live in Troy Ohio with our 2 dogs. We have 3 great children and 4 wonderful grandchildren. 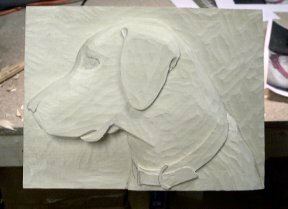 I began carving in 1999 while stationed in Italy. 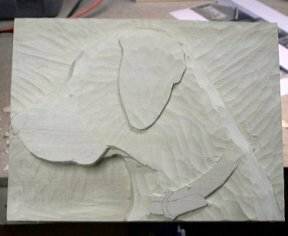 Carving was something I wanted to do for years but was afraid because of risk of failure or finding out I had no talent. I think it was the Italian art and culture that gave me the extra inspiration I needed to get started. After picking up a few gouges and knifes and butchering some wood I fell completely in love with carving. My passion has increasingly strengthened over time. I soon learned that few are born with talent and the rest of us get it from practice. 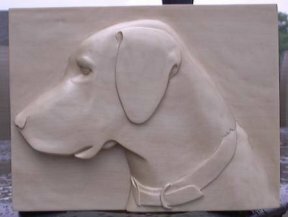 Although I have not received formal training in carving, I have followed the masters and learned by watching and doing. 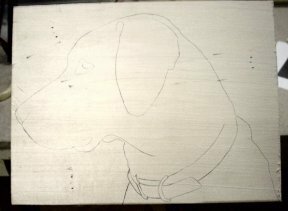 I begin by using carbon paper to trace the image onto the wood using a copy of the photograph. Then, I complete a series of stop cuts around the parameter until I reach the desire depth. Of course this step would be eliminated if the carving is done with out a background. In that case, I would just cut out the image using a bandsaw. The desired depth in this carving was at about 3/4 “. Now I cut down the next lower section using the same process of stop cuts. 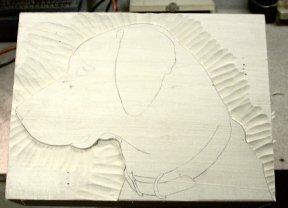 At the same time I began shaping the carving by rounding the edges. I continued shaping and rounding edges until I have the basic shape. 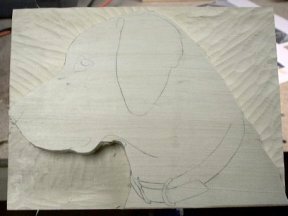 I also finish the carving by working the details of the carving such as the eye, nose, mouth, and collar. I then finished the carving by sanding and applying a finish to protect the wood, in this case, I used a polyurethane spray.